Stars in their courses : the Gettysburg campaign, June-July 1863 · One Book. One Author. One Hour. Underlinings/notes: Underlinings: Lamb notes Foote's education and early career, titles of his novels, and his 3 vol. tomb on the Civil War which took 20 years to write, and the impact of the war. Lee, his aura, Grant, Ewell, Confederate views of Northern land. Lee's commanders all from West Point with exception of one from VMI. Details on battle of Gettysburg." Notes: "78 years old," "AP," "novels," "Civil War defined us." [p. viv] "Tacitus, Ralph Neuman bibliography, Civil War History 20 years, Was interested in focusing on the west battles as well as the east. Why did we fight the Civil War. What did the death of Stonewall Jackson do? Lincoln's letters to commander in the field. How important were the generals. Trains& couriers. Lee--his inward anxiety. Why did everyone so respect R.E. Lee." "Confederates liked the lush land, sleek cattle etc.," "Lee was asked for autograph by Northerners." 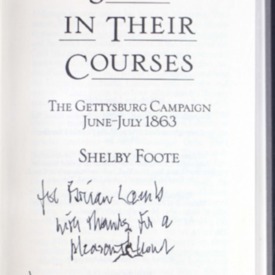 Foote, Shelby, “Stars in their courses : the Gettysburg campaign, June-July 1863,” One Book. One Author. One Hour., accessed April 24, 2019, http://booknotes.gmu.edu/items/show/300. Program air date: September 11, 1994. Recreates the Battle of Gettysburg from both the Confederate and Union perspectives.